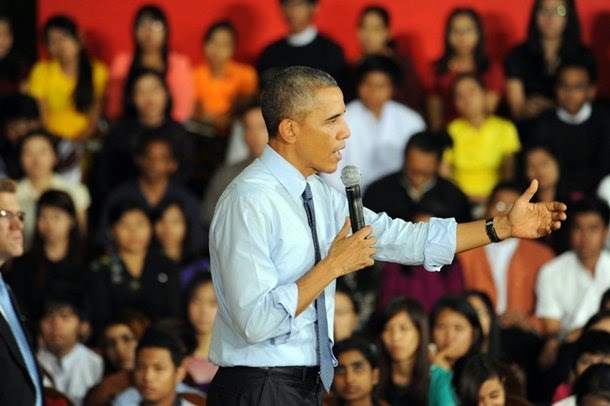 RANGOON —“You’re always popular in someone else’s country,” US President Barack Obama told a beaming audience of Asean’s young and ambitious at a town hall-style meeting in Rangoon on Friday. Most attendees were delegates of the White House-backed Young Southeast Asian Leadership Initiative (YSEALI), who were invited by the president at the end of his second visit to Burma in the past two years. While the enthusiastic and elegantly dressed delegateswarmly greeted the president, many made sure to register their disappointment in what they viewed as America’s “soft stance” toward Burma’s leadership. “Why is America so soft on the issue of minority rights in Burma?” asked Wai Wai Nu, a Rohingya activist, former political prisoner and member of YSEALI. The president spoke at length about the importance of distinguishing between national and ethnic identity, but he made no mention of the country’s most contentious designation, Rohingya. Wai Wai Nu, who at 27 is already an award-winning peace advocate, urged the United States to “re-evaluate its policy toward Burma” with a particular focus on human rights and equal access to citizenship. Several of her peers expressed similar views. Khun Kit San, an ethnic Shan activist, greeted Obama with a banner reading “reform is fake.” One attendee, when given the president’s ear, handed him a two-page letter penned by “Young People from Myanmar” denouncing Burma’s reforms as fraudulent and driven by capitalist interests. Obama did acknowledge that “some reforms haven’t come quickly enough,” but urged patience among the country’s future leaders. “The most important challenge is completing the transition to democracy,” he said, reiterating the importance of free, fair and timely elections, amending the Constitution and instating laws to protect press freedoms. Friday’s town hall meeting was the last stop on Obama’s second visit to Burma as head of state, devoting a full hour and a half to young intellectuals from all 10 memberstates of the Association of Southeast Asian Nations (Asean). When Obama visited in 2012, he also made an historic appearance at Rangoon University, which had been shuttered for most of the past two decades because of its history as a breeding ground for dissidence under the former military regime. Obama arrived in Naypyidaw on Wednesday to attend the Asean and East Asia summits. On Friday, Obama met with opposition leader Aung San Suu Kyi at her home in Rangoon, where they pledged continued cooperation through Burma’s long and turbulent transition to democracy.